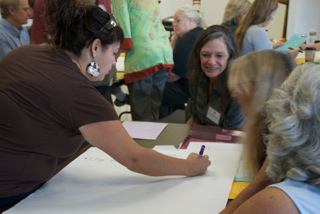 Louann Baker, ALLIES coordinator, center, watches as Watsonville High School English teacher Marvilyn Quiroz adds her contribution during the ALLIES institute. The grant is one of 14 totaling $3.5 million from the California Postsecondary Education Commission's Improving Teacher Quality Program that links select high school districts with university schools of education. The objective is to help teachers prepare high school students for the rigor of college and career work through analytical reading and writing, as required by the new Common Core State Standards. The program, called Alliance for Language and Literary Instruction Effecting Standards (ALLIES), will work with up to 40 English teachers from Watsonville, Pajaro Valley, and Aptos high schools. The program begins with a kick-off institute today and Saturday. Common Core State Standards are part of a state-led effort within the national "Race to the Top" educational initiative to establish a shared set of clear standards for English language arts and mathematics. The state Postsecondary Education Commission says the new standards are different enough to warrant new teacher development. "We're really grateful for the grant because it will help our English teachers move away from the standards we have now to the Common Core Standards," said Murry Schekman, PVUSD's assistant superintendent for secondary education. "Working closely with the folks at UCSC in developing our methodology will be awesome," said Schekman, himself a UCSC alumnus. Judith Scott, associate professor of education at UC Santa Cruz, said the grant will be used to provide opportunities for teachers to meet with each other and local educational leaders to focus on effective teaching strategies. Teachers will meet monthly and attend intensive Saturday institutes developed by a consortium of education leaders from five different agencies including the UCSC Central California Writing Project, the UCSC Writing Program and Education Departments, PVUSD, and the Santa Cruz County Office of Education. High school teachers don't often have the opportunity to get together and share techniques and best practices. "Teaching is hard," Scott said. "It can be isolating." This program will give them the opportunity to work together with teacher educators and coaches to explore students’ writing in depth. Joining Scott in leading the research component of the project is Lucinda Pease-Alvarez, associate professor of education. Louann Baker, co-director of the Central California Writing Project and a teacher supervisor at UCSC, is the project coordinator. Baker said the project will support the high school teachers to help students develop writing that reveals critical thinking about issues and problems. "Writing is thinking," Baker said. "Good writing is hard to assess," she said, explaining how good writing is critical for student success after high school whether in college or the workplace. The program will be evaluated after the first full year and funding could be extended for another year depending on performance.